Knock, Knockâ¦.Hereâs the opportunity you may have been waiting for in the prestige area of College Park East! The most popular 4 bedroom, single story âColumbiaâ model home with 2016 square feet located in a prime interior location. The home is priced below market so you can take advantage and save on the purchase price and update the house incorporating your own personal charm & taste. Youâll be captivated and drawn to the open & spacious floor plan featuring a soaring vaulted ceiling in the living room & entry and showcased by an array of natural light through the custom bay window plus a brick fireplace /hearth and adjacent to the formal dining room. A wonderful great room/kitchen with cozy breakfast nook is perfect for casual daily living and just outside is a low maintenance backyard with custom brick patio perfect for summertime BBQâs and extending year round entertaining options for the popular Southern California lifestyle. Additionally there are dual pane Milgard windows throughout the home and located in a friendly neighborhood community with year round activities for the children and families in CPE. 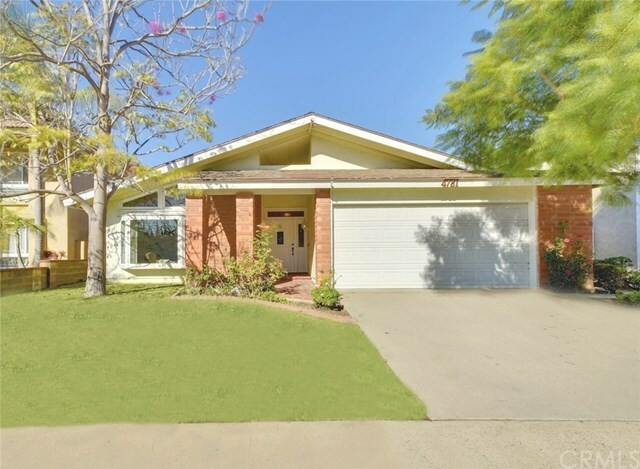 Conveniently located to nearby shopping at the Old Ranch Town Center & Rossmoor Center, Old Ranch Country Club, access to 405/605 & 22 freeways, plus the highly acclaimed Los Alamitos School District!